SOCHI: Magnus Carlsen asserted his supremacy over Viswanathan Anand for the second year in running as the Norwegian retained his World Championship title after defeating the Indian Challenger in the 11th game on Sunday. The Norwegian world champion closed the 12-game match with a 6.5-4.5 scoreline, courtesy his win in the penultimate game. 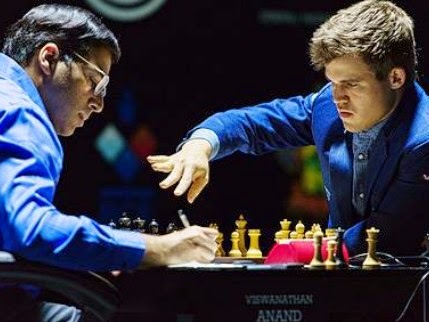 While this may have been closely fought in the eyes of the experts, the fact remains that Anand lasted only one extra game compared to the 2013 match at Chennai when it was all over in the tenth game of the match itself. For Anand, there were a lot of lessons to be learnt and it is clear that the five-time world champion will probably like to get another shy at the title during the next Candidates tournament. Anand knew that a draw would keep him in the match but expectedly the Indian ace was not hooked to the idea of staying on till the last game of the 12-game match, and tried to complicate when he got the first opportunity. When Anand went for the real complications the opinion of the experts was pretty divided out of another Berlin defense game. While the opening discussion continued, Anand was the first to deviate from earlier games in the same opening and in the opinion of Ian Nepomniachtchi, a former second of Carlsen, Anand went for unwarranted complexities. 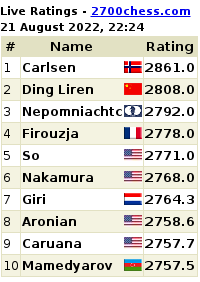 In the 11th game too, Anand made fewer mistakes than Calrsen and some even opined that the Indian had better chance. As it happened in the game, Anand came up with an exchange sacrifice when according to Grandmaster Peter Svidler, 'he felt he ought to be doing something'. As things became clear, the exchange sacrifice was probably not the best of solutions for Anand in a seemingly equal situation and this was what eventually plotted the downfall for the Indian, Anand however regretted his decision to sacrifice a rook for a minor piece. "It was a bad gamble, and I got punished," he said. Carlsen on his part remained the calculation machine he is known to be and his super judgment on the position was the critical factor to seize the initiative. Anand was pretty sure that the position was equal before that but while he was playing objectively till a certain point but took a nervous decision in the match. Anand could have drawn this and gone on in the 12th game of the match in a must-win situation. Anand conceded after the match that Carlsen's nerves held better in this match. But for the experts, it was clear that Anand had his chances which he did not capitalise. 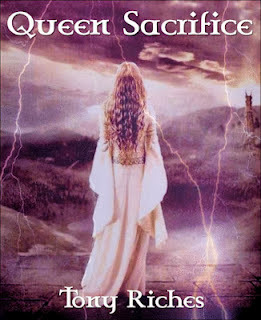 "Taking in to account that all things considered he did better. I did not something better and some things worse," Anand concluded at the post-game conference. 1. e4 e5 2. Nf3 Nc6 3. Bb5 Nf6 4. O-O Nxe4 5. d4 Nd6 6. Bxc6 dxc6 7. dxe5 Nf5 8. Qxd8+ Kxd8 9. h3 Bd7 10. Nc3 h6 11. b3 Kc8 12. Bb2 c5 13. Rad1 b6 14. Rfe1 Be6 15. Nd5 g5 16. c4 Kb7 17. Kh2 a5 18. a4 Ne7 19. g4 Ng6 20. Kg3 Be7 21. Nd2 Rhd8 22. Ne4 Bf8 23. Nef6 b5 24. Bc3 bxa4 25. bxa4 Kc6 26. Kf3 Rdb8 27. Ke4 Rb4 28. Bxb4 cxb4 29. Nh5 Kb7 30. f4 gxf4 31. Nhxf4 Nxf4 32. Nxf4 Bxc4 33. Rd7 Ra6 34. Nd5 Rc6 35. Rxf7 Bc5 36. Rxc7+ Rxc7 37. Nxc7 Kc6 38. Nb5 Bxb5 39. axb5+ Kxb5 40. e6 b3 41. Kd3 Be7 42. h4 a4 43. g5 hxg5 44. hxg5 a3 45. Kc3 1-0. Sochi, Nov 8: World Chess Championship Match 2014 between reigning World Chess Champion Magnus Carlsen of Norway and five-time World Chess Champion Viswanathan Anand of India begins today in Russia at 5.30 pm in the city of Sochi. You can watch it live at the official website from 5.30 pm onwards. A glittering ceremony, opening press conference and pre-match 'rituals' took place yesterday in Sochi -- all broadcast live via the high-powered super-sleek official website last evening. The took place at the Congress Hall of the Radisson Blu Hotel and was attended by the International Chess Federation (FIDE) President Kirsan Ilyumzhinov, the Russian Chess Federation President Andrey Filatov, the adviser of the Russian President Igor Levitin, former World Champions Boris Spassky, Nona Gaprindashvili, Anatoly Karpov, Alexander Khalifman, Zhu Chen, Antoaneta Stefanova, Alexandra Kosteniuk, Russian deputy minister of sports Pavel Kolobkov and other officials, chess stars, and eminent guests. Russian People's Artist Sergey Makovetsky and 12th WOmen's World Chess Champion ChessQueen Alexandra Kosteniuk were hosts of the ceremony. Igor Levitin read out the welcome address of the Russian President Vladimir Putin:“Russia deserves the honour of holding this important and prestigious event. Our country has won wide recognition for its chess school and has extensive experience at holding events of this level, all the more so as this championship match is taking place in Sochi, which hosted the Winter Olympics earlier this year. Kirsan Ilyumzhinov on behalf of the FIDE Presidential Board (the International Chess Federation unites 181 countries) sent greetings to the guests of the championship. He revealed a rich competitive and cultural agenda during the championship – the Tal Memorial grandmaster blitz tournament, junior Tournament of champions, master-classes, simultaneous displays, etc. In the end Mr. Ilyumzhinov wished good luck to the match participants and expressed hope for brilliant and exciting games. 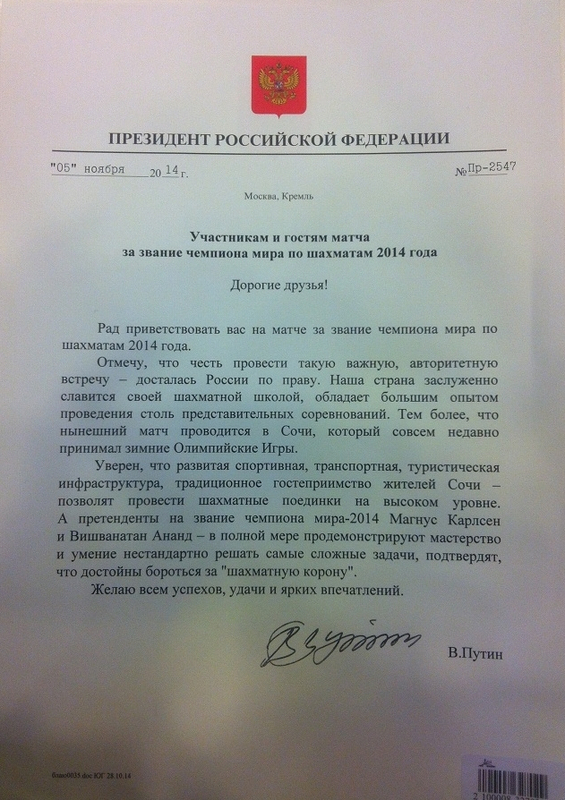 Igor Levitin awarded the Russian players with state decorations. The order “For Merit to the Fatherland” of the 1st class was given to Alexandra Kosteniuk, Natalia Pogonina received this order of the 2nd class. Olga Girya and Sergey Rublevsky received Honorary Mentions of the Russian President. These players and the Russian women's team coach got their awards for winning the 2014 Chess Olympiad in Tromso, Norway as well as for their contribution to chess development in our country. After the mime show “Dance of chess queens” the Chief Arbiter of the match Andrzej Filipowicz (Poland) called for the drawing of lots. Vishy Anand will have the white pieces in the first game. The grandmasters will play 12 games with classical time control: 120 minutes for 40 moves, then 60 minutes for 20 moves, and then 15 minutes plus 30 seconds per move for the rest of the game. If the match is tied, the tie-break with quick time controls will take place on November 27th. The ceremony was concluded with the concert of a singer Tina Kuznetsova and the Jazz Quartet of People's Artist of Russia Igor Butman. World Chess Championship 2014 in Sochi between five-time World Chess Champion Viswanathan Anand and reigning World Chess Champion Magnus Carlse: Indian Prime Minister Narendra Modi today extended his good wishes to Indian chess wizard Viswanathan Anand as he prepared to reclaim the World Championships title from Norwegian Magnus Carlsen in Sochi, Russia from tomorrow. Indian Prime Minister Narendra Modi with five-time World Chess Champion Viswanathan Anand. 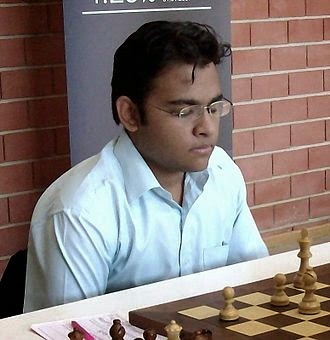 Press photo from the Gujarat Swarnim Chess Mahotsav, 2010. "Good Luck Vishy! Conveying my best wishes to our pride, Viswanathan Anand for the World Chess Championship in Sochi," Modi tweeted. The much-awaited clash will conclude on November 28 during which Anand will take on Carlsen in a repeat of the 2013 World Championships. Pune: India's Vidit Santosh Gujrathi got off to a flying start by quickly winning the first round of the World Junior Chess Championship which commenced at Hotel Hyatt on Monday, defeating compatriot Ritviz Parab. Second seed Robin Van Kampen also quickly won his game against Jan Rindlisbacher of Switzerland with black pieces in 28 moves after adopting the Sicilian Defence. FM Rakesh Kumar Jena, rated 2164, created a flutter when he held higher rated and 10th seed GM Grigoryan of Russia to a draw after 30 moves of a Sicilian Defence. Vidit, the fourth seed, playing with black pieces, opted for a super sharp Sicilian defence against the King Pawn Opening. "I had decided to play aggressively and I am happy that my gamble played off as I managed to get an advantageous position early on," said Vidit. A tentative and timid pawn push in the centre on the 15th turn by Ritviz had Vidit immediately pushing his pawn more boldly in the centre to get advantage. Another wrong queen move on the next turn had Vidit smelling victory and his queen, rook and knight soon swung into action to decide the game in his favour after 23 moves. India's Padmini Rout obtains easy win over Turkova Karolina of Slovakia. Iranian FM Amir Kousarania (2331) missed his flight and hence was not paired in the first round. He will begin his campaign from the second round. Ten-year old Nihal Sarin, the freshly crowned World-Under 10 champion, stole the limelight with a 94-move victory over higher ranked IM Jonathan Westerberg of Sweden as the LIC-sponsored World Junior Chess championship got underway here Monday. Nihal said: "Obviously, today's match was a very tough as it lasted so many moves, but there was no tension and I enjoyed it very much." Interestingly, it was the very first time that Nihal played against a titled player though his handling of two pieces for his opponent's rook in a Bogo Indian Defence defied his age and experience. Collectively, it was a good day for Indians with GM Sahej Grover, GM Ankit Rajpara, IM Aravindh Chithabamram, IM Diptayan Ghosh and IM Sayantan Das, IM Shardul Gagare scoring victories over their lesser rated opponents. FM Rakesh Kumar Jena, rated 2164, created a flutter when he held higher-rated and 10th seed GM Grigoryan of Russia to a draw after 30 moves of a Sicilian Defence. Untitled Sai Vishwesh also rose to the occasion and held 14th seed GM Nijat Abasov of Azerbaijan to a draw in a Spanish Opening game which lasted 50 moves. The biggest upset of the day was the loss of 19th seed IM Murali Karthikeyan (2499) who went down to his Tamil Nadu state-mate Siva Mahadevan. Boys: Vladimir Fedoseev (Rus) bt M Chakravarthi Reddy; Jan Rindlisbacher (Sui) lost to Robin Van Kampen (Ned); Wei Yi (Chn) bt A Muthaiah; Parab Ritviz lost to Vidit Santosh Gujrathi; Cori Jorge (Per) bt Konstantinos Megalios (Gre); Pranav Shetty lost to Duda Jan-Krzysztof (Pol); Benjamin Bok (Ned) bt Erik Ronka (Fin); Utkal Ranjan Sahoo lost to Karen Grigoryan (Arm); Aleksandar Indjic (Srb) bt Samir Sen (Usa); Rakesh Kumar Jena drew with Grigoriy Oparin (Rus); Vladislav Kovalev (Blr) bt Slaven Pastar (Bih); D Yashas drew with Kamil Dragun (Pol); Lu Shanglei (Chn) bt P Iniyan; C Sai Vishwesh drew with Nijat Abasov (Aze); Mikhail AAntipov (Rus) bt Fong Yit San (Mas); Rodrigo Mendoza (Bol) lost to Idani Pouya (Iri); Ankit R. Rajpara bt Rajdeep Sarkar; Yogesh Gautam lost to Diptayan Ghosh; Murali Karthikeyan lost to Siva Mahadevan; Sammed Jaykumar Shete lost to Ulvi Bajarani (Aze); Sahaj Grover bt A Abhishek. Girls: Aleksandra Goryachkina (Rus) bt Parnali S Dharia; Karina Azimova (Rus) lost to Meri Arabidze (Geo); Sarasadat Khademalsharieh (Iri) drew with Gu Tianlu (Chn); Liu Manli Chn (Chn) lost to Daria Pustovoitova A(Rus); Zhai Mo (Chn) bt Marie Antoinette San Diego (Phi); Karolina Turkova (Svk) lost to Padmini Rout; Ni Shiqun (Chn) drew with P Bala Kannamma; Angelina Fransson (Swe) lost to Nguyen Thi Mai Hung (Vie); Lisa Schut (Ned) lost to Madhurima Shekhar; Ani Krumova (Bul) drew with Anna Iwanow (Pol); Marina Brunello (Ita) bt Solenn Afraoui (Fra); Mitzy Mishe Caballero Quijano (Per) lost to Sabina Ibrahimova (Aze); Klara Varga (Hun) bt Rutuja Bakshi; Larissa Ichimura Barbosa (Bra) lost to Irina Petrukhina (Rus); Sarvinoz Kurbonboeva (Uzb) drew with Jessica Bengtsson (Swe). Grandmaster and former world junior chess champion Abhijeet Gupta got off to a good start, crushing Kolbus Dietmar of Germany in the first round of Poker Masters Isle of Man International chess tournament here. Seeded 10th in a very strong line-up that includes world number 12 Michael Adams of England and number 13 Maxime Vachier Lagrave of France, Gupta played out a chanceless game with his black pieces to show signs of good form in the 18000 pound sterling prize money tournament. The other Indian in the fray, Grandmaster D Harika also made a good beginning as she got full points against Eddie Luiz Sant Anna of Brazil. Harika, fresh from her bronze medal performance in the last women’s Grand Prix at Sharjah, got the point with black pieces. The opening day in one of the strongest open tournament in recent UK history was not devoid of upsets as third seeded Grandmaster Laurent Fressinet was held to a draw by Simon Ansell of England. Fressinet, a member of the 2700 ELO rating club, did not get many chances to convert his slightly superior position in the endgame and seasoned Ansell deserved all credit for pocketing a half point against one of the leading players in the tournament. Gupta came up with his pet Grunfeld defence to counter the queen pawn opening by Kolbus and the German was out of his book quite early when the Indian decided to give a slightly better position rather than go for a simplified and equal endgame. The strategy paid off as Kolbus was saddled with the task of handling a complicated position in which Gupta excelled with a timely attack on the white king. Kolbus lost a pawn while trying to wriggle out of his problem and that was enough for the Indian to transpose to a winning endgame. “I think he had his chances when I allowed a trick inadvertently, but we both failed to spot it thankfully, it was a nice game for an opening round in the end,” Gupta said after the game. Adams is not a regular customer in open events but that uneasiness did not show in his clean victory against compatriot Mark Fergusson. The English opening gave England’s highest ranked player an edge and he nurtured it easily to win in 37 moves. Important results after round 1: Michael Adams (ENG) beat Mark Ferguson (ENG); Alina L’Ami (ROU) lost to Maxime Vachier-Lagrave (FRA); Laurent Fressinet (FRA) drew with Simon Ansell (ENG); Marcel Peek (NED) lost to Gabriel Sargissian (ARM); Julio Granda Zuniga (PER) beat Gerard Welling (NED); Stephen Mannion (SCO) lost to Sergei Tiviakov (NED); Gawain Jones (ENG) beat Christopher Wallis (AUS); Alan Tate (SCO) lost to David Howell (ENG); Nigel Short (ENG) beat Chris Duncan (ENG); Dietmar Kolbus (GER) lost to Abhijeet Gupta; Sant Anna, Eddie Luiz lost to D Harika. Grandmasters Vidit Santosh Gujarathi and Padmini Rout are among the hot favourites for the title in the World Junior Chess Championships commencing here Monday. Gujrathi, who has had a phenomenal run for the last one year in International chess, starts as a strong contender and is one of the five super Grandmasters (Rating above 2600) in fray. Padmini, the most medal-decorated girl in Age Categories, will also be a favourite, especially after a glittering gold medal performance in the recently concluded World Chess Olympiad. Incidentally, Padmini is also amongst the top five highest rated girls in fray. The organisation is in full gear by now. The Facebook (www.facebook.com/WorldJuniorChess2014) and Twitter (www.twitter.com/MCL_CIS) handles of the event are already busy, creating a buzz before the event, not to forget the official website. An impressive array of titled players of the state of Maharashtra have been lined for live web video commentary during the event - former world junior girls champion WGM Soumya Swaminathan along with IM Sagar Shah, IM Prathamesh Mokal, and WGM Swati Ghate. The last time that India hosted the championship here in 2008, Abhijeet Gupta and Dronavalli Harika clinched the titles. Incidentally, it was the first and only time in the history of the game that two players from the same country had won the title. The event is spread over 15 days and will comprise of 13 rounds with more than 200 players from 45 countries confirming their participation. The Government of Maharashtra and Life Corporation of India (LIC) are the main sponsors while ONGC, Amanora, Jain Irrigation and Everstone are the other sponsors. Vladimir Fedoseev (2661) of Russia, currently ranked 88th in the World, is the top seed followed by Robin van Kampen (2641) of the Netherlands, Yi Wei (2641) of China, Gujarathi (2635) and Jorge CoriA (2612) of Peru. It is expected to be a close contest amongst these super GMs. The other Indians to be watched out for in this section are GM Ankit Rajpara, GM Sahej Grover, IM Aravindh Chithambaram, IM Shardul Gagare, IM Murali Karthikeyan and IM R. Prasanna among others. In the girls section, WGM Alexandra Goryachkina (2430), the defending champion is the highest rated player in fray and is followed by Meri Arabidze (2409). Interestingly, there is a wide rating gap between these two girls as other strong contenders are rated 2300 plus. Padmini, after an indifferent showing in the National Women's Challenger has lost a few precious points. Gujarathi has gained around 30 rating points from the recent Rating List released on October 1 which is a clear-cut indication of him gaining strength in the build up to this event. He recently won a strong Category-16 tournament in Armenia and would be definitely wanting to elevate his performance from bronze at the last edition to a gold. "I am happy that the event is being conducted in Pune, as there is nothing better than home advantage and most importantly, food advantage," he said. Grandmaster Abhijeet Gupta, the highest rated Indian in the fray, shot into sole lead, defeating Hatim Al-Hadarani of Yemen in the fourth round of 16th Dubai International open chess tournament on Friday. The victory with black pieces turned out to be fourth in a row for Gupta and his clean slate helped him annex the sole lead on four points. 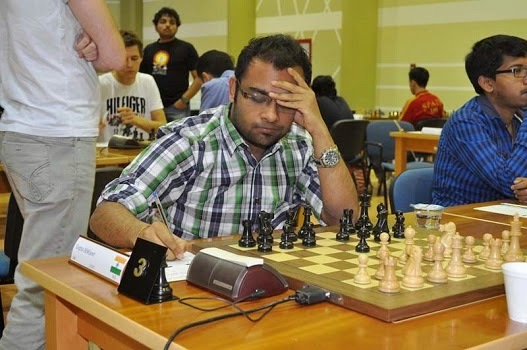 It was a clean effort by the Indian as Hatim Al-Hadarani fell prey to some finely crafted manoeuvres in the endgame. As many as six players — Axel Bachmann of Paraguay, Eduardo Itturizaga of Venezuela, Zaven Andriasian of Armenia, Constantin Lupulescu of Romania, Anuar Ismagambetov of Kazakhstan and Romain Edouard of France — remain on the heels of the leader with 3.5 points apiece. With five rounds still to come in the $50,000 prize money tournament, another 32 players are in close pursuit with three points each. However, the day belonged to Gupta as he made the most of opportunities against Hatim Al-Hadarani who played an irregular queen pawn game. Playing black, Gupta obtained a complicated middle game and then pounced on a killer stroke that netted him a pawn without any counter play. As the game progressed, Al-Hadarani fell under time pressure and the ensuing rook and pawns endgame was no respite. 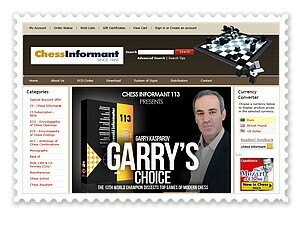 Grandmaster M.R. Lalith Babu also came up with a good result although he was not quite satisfied with the draw against highly regarded Vladimir Akopian of Armenia as the Indian felt he held good chances in the middle game and then in the endgame. For the record, it was a Slav defence wherein Akopian got in to some difficulties and the liquidation also resulted ina worse endgame. Resourceful as he is, Akopian fought on to get the equality he was looking for and the peace was signed in 54 moves. Grandmaster Sahaj Grover put his loss against Abhijeet Gupta aside and scored an easy victory over compatriot Harshal Shahi. The Taimanov Sicilian by Shahi did not yield desired results as Grover got an opening advantage that he nurtured well enough to score his third victory in the tournament. Important and Indian results round 4 (Indians unless specified): Romain Edouard (Fra, 3.5) drew with Axel Bachmann (Par, 3.5): Anuar Ismagambetov (Kaz, 3.5) drew with Eduardo Iturrizaga (Ven, 3.5); Hatim Al—Hadarani (Yem, 3) lost to Abhijeet Gupta (4); Anton Korobov (Ukr, 3) drew with Ghaem Maghami Ehsan (Iri, 3); M R Lalith Babu (3) drew with Vladimir Akopian (Arm, 3); Aleksandr Rakhmanov (Rus, 3) drew with M Shyam Sundar (3); Zaven Andriasian (Arm, 3.5) beat Debashis Das (2.5); Swapnil Dhopade (2) lost to Yuriy Kuzubov (Ukr, 3); Solak Dragan (Tur, 3) beat Sayantan Das (2); Cicak Slavko (3) beat Aniruddha Deshpande (2); Sahaj Grover (3) beat Harshal Shahi (2); V Karthik (2) lost to Jahongir Vakhidov (Uzb, 3); Marina Makropoulou (Gre, 2) lost to Ashwin Jayaram (3); S Ravi Teja (2.5) beat Mayed Al—Rashedi (2); Prince Bajaj (2.5) beat Al Badani Abdu (1.5); Moayed Obied (1.5) lost to Abhishek Kelkar (2.5); N Raghavi (2.5) beat Harikrishnan Samyuktha (1.5); Sultan Ibrahim (2) drew with Ivana Maria Furtado (2); C R G Krishna (2) beat Ahmed Holi Ali Moawia (1); Felix Tuomainen (1) lost to Pratyusha Bodda (2); Assaubayeva Bibissara (Kaz, 1.5) drew with Nishant Malhotra (1.5); Faranka Khaled (1) lost to Nimmy George (2); Marcos Marvin (Phi, 2) beat Akshay Halagannavar (1); A K Elnaami Hashem (1) lost to Siva Mahadevan (2). 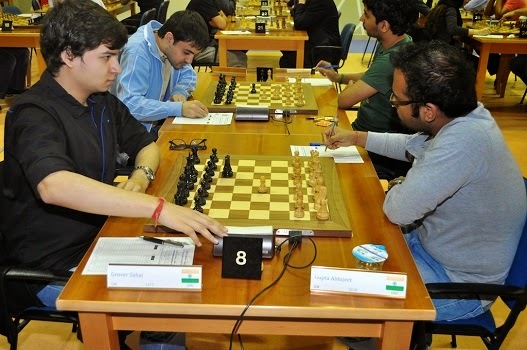 Dubai Chess Open 2014 Round 3 - Grandmaster Abhijeet Gupta got the better of Grandmaster Sahaj Grover to stay in joint lead after the end of the third round of 16th Dubai International Open Chess tournament on Thursday. It turned out to be another good day for Gupta, who played almost flawless chess to score his third victory in as many rounds in this USD 50000 prize money tournament. With six rounds to go, its a six-way tie at the top with Eduardo Romain of France, Axel Bachmann of Paraguay, Anuar Ismagambetov of Kazakhstan, Eduardo Itturizaga of Venezuela, Hatim Al-Hadarani of Yemen and Gupta sharing the honours with a perfect score. Indian Grandmasters -- M R Lalith Babu, Debashish Das, M Shyam Sundar -- and International Master Diptayan Ghosh are among those who have 2.5 points and this list is topped by highest ranked Anton Korobov of Ukraine. In all there are 18 players sharing the seventh spot on 2.5 points each and they are followed by a pack of 43 hopefuls, including Sahaj Grover with two points apiece. Gupta played a fine game to beat Grover from the white side of a Queen's Indian defense. Grover tempted Gupta in to an exchange sacrifice that was hard to judge and the latter took the bait to reach a tense endgame. The right defense would have yielded a draw but Grover could not find it with his clock ticking away and ended up losing a handful of pawns that proved decisive. After a sedate start, Lalith Babu came back in reckoning after scoring over Dinara Saduakassova of Kazakshtan. The Nimzo Indian defense by Lalith Babu came good as he won queen in a favourable position against two rooks. While Saduakassova tried to work her counter play, the damage was done as Queen and Knight proved to be a lethal combination. The game lasted 52 moves. Among other Indians in the fray, Debashish put up a perfect defense to hold higher ranked Csaba Balogh of Hungary in a long drawn endgame. Das was down a knight but his two pawns kept him in contention and some fine calculations towards the end saved the day. Important and Indian results of Round 3 (Indians unless specified): Ante Brkic (Cro, 2.5) drew with Anton Korobov (Ukr, 2.5); Pavel Kotsur (Kaz, 2) lost to Romain Edouard (Fra, 3); Debashis Das (2.5) drew with Csaba Balogh (Hun, 2.5); Anuar Ismagambetov (Kaz, 3) beat Amin Bassem (Egy, 2); Eduardo Iturrizaga (Ven, 3) beat Pontus Carlsson (Swe, 2); Abhijeet Gupta (3) beat Sahaj Grover (2); Diptayan Ghosh (2.5) drew with Aleksandr Rakhmanov (Rus, 2.5); Axel Bachmann (Par, 3) beat V Karthik (2); Al-Hadarani Hatim (Yem, 3) beat Rinat Jumabayev (Kaz, 2); Viorel Iordachescu (Mda, 2.5) beat S Ravi Teja (1.5); Dinara Saduakassova (Kaz, 1.5) lost to M R Lalith Babu (2.5); Ziaur Rahman (Ban, 2.5) beat Prince Bajaj (1.5); Nimmy George (1.5) lost to Adrien Demuth (Fra, 2.5); Ashwin Jayaram (2) beat Nishant Malhotra (1); Swapnil Dhopade (2) beat Marvin Marcos (Phi, 1); Siva Mahadevan (1) lost to Amirreza Pourramezanali (Iri, 2); Sayantan Das (2) beat Alattar Rakan (Jor, 1); Harshal Shahi (2) beat C R G Krishna (3); Abhishek Kelkar (1.5) drew with Sultan Ibrahim (Uae, 1.5); Aniruddha Deshpande (2) beat Hamed Mohamed (Sud, 1); Ahmed Fareed (Uae, 1.5) drew with N Raghavi (1.5); Harikrishnan Samyuktha (1.5) drew with E Momeni (Iri, 1.5); Ivana Maria Furtado (1.5) beat Guliyev Gasan Alipasha (Aze, 0.5); Pratyusha Bodda (1) drew with Assaubayeva Bibissara (Kaz, 1); Akshay Halagannavar (1) beat Ahmed Al Khatib (Jor, 0).